Wifey skating at the outdoor rink. I took the photo with a yam. Last month was the coldest February on record! It was also the coldest month on record! Sheesh! No wonder water mains have been bursting all over Toronto and the maple syrup isn't flowing. Aside from staying indoors and binge watching House of Cards*, what else is there to do? Actually, there are lots of things to do during this cold stretch of weather we've been having. The first thing that comes to mind are long walks outside. Sure, it's cold. But we're not walking outside in a T-shirt are we? We're going to be bundled up in our boots, thermal pants, and parkas. Once the walk gets going you'll basically warm yourself up. The next thing that comes to mind are winter hikes at the park. Wifey and I did this on a few occasions. It's a blast. A walk around this particular section of the park near our house is approximately 30 minutes in the summer. In the winter, I don't have a clue how long as I'm bundled up and reaching for my phone in my pocket is more trouble than it's worth. It's a big change from the summer as all the plants and flowers are gone and replaced with heaps of snow. Again, you need to be bundled up. However, you'll quickly warm up as you struggle through the knee high snow drifts. Another thing you can do is skate for free at an outdoor rink. You'll need to bring your own skates, otherwise you'll be required to shell out some money for skate rentals ($10 for adults, $5 for children). If you go early enough, you'll have the rink all to yourself as wifey and I did this past weekend. Since we don't skate that often, we finished after half an hour. The zamboni was going around when we arrived, so we had a fresh ice surface to work with once we got our skates on. If an outdoor rink is not your thing, you could go to an indoor rink. However, those aren't free. In Markham, I believe the fee is $4 per person. 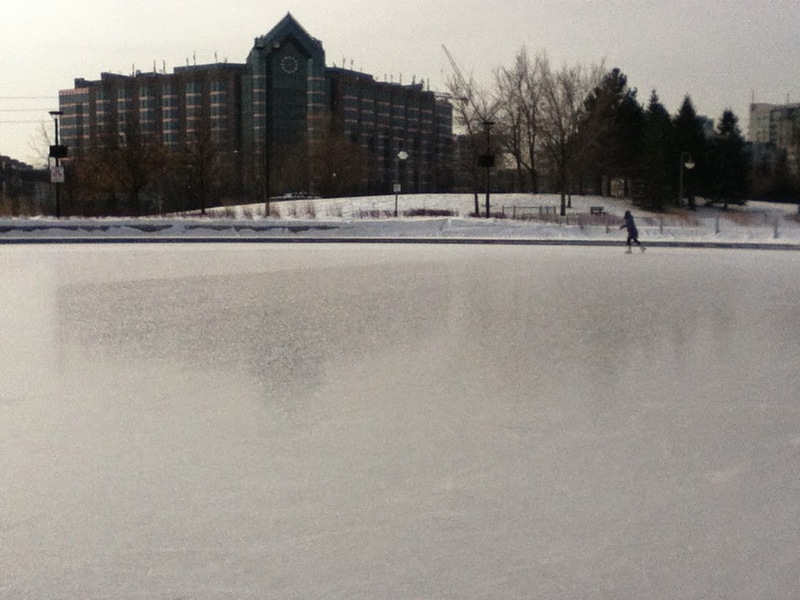 Not a lot, but if you skate for half an hour, it's not really worth the price of admission. Other things you can do for free? Well, with all the snow we got the past winter and none of it melting away, you can also go tobogganing. I've seen a few neighbourhood kids ride down the slopes near the school. I've always loved tobogganing when I was younger, it's definitely a lot of fun and a lot of exercise as you need to trudge up a hill covered in snow. There's also the option of cross country skiing at one of the free courses somewhere in Ontario. I think you'll need to drive a fair distance and you'll need to have your own skis. Wifey is very interested in this. I'm lukewarm to the idea as we'd need to buy cross country skis. So all these ideas are outdoors. What about free indoor activities? Frankly, I don't really know. I'm sure the community centre and library have a few events going on this winter. With a quick perusal of the library website, I see that there is an open mic night coming up. There are also art exhibits and reading activities for kids. No shortage of free things to do. Despite the cold, you don't need to hole yourself up like a hermit. Nor do you need to spend money to do things outside of the house. You just need to get out of the house. *Not technically free as you need the subscription to Netflix. However, a co-worker shared their Netflix account with me.